Etosha National Park is Namibia's premier wildlife destination and one of Africa's largest game reserves. Large herds of wildlife teem around the waterholes and the endless plains offer breathtaking vistas. The Ongava Game Reserve shares a boundary with the Etosha National Park. Activities at Ongava Tented Camp revolve around day and night wildlife-viewing drives, visiting hides that overlook waterholes and walks with experienced guides. The Ongava Game Reserve features much of the characteristic wildlife of the area, with both desert-adapted black and white rhino to be seen as well as lion. Game drives and daytrips into the easily accessible Okaukuejo area of Etosha National Park are rewarding, with sightings of lion, elephant, gemsbok, springbok, red hartebeest, and white and black rhino. Guests at Ongava Tented Camp share a dedicated guide and Land Rover, ensuring the best possible nature experience at one of Africa's great wildlife destinations. Etosha is Namibia's premier game viewing destination. 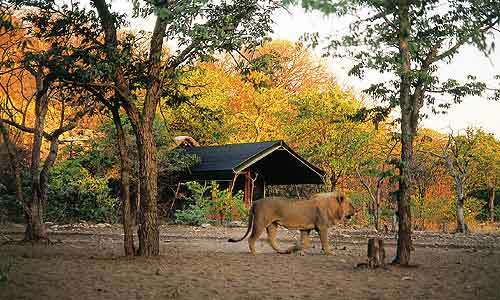 It is one of Africa's largest game parks being nearly the size of Switzerland. Large herds of plains game concentrate around the waterholes in the dry season making for exciting game viewing. A highlight at Ongava Tented Camp is that it is one of the few private game reserves in Southern Africa where you have a chance of seeing both black and white rhino. For those who enjoy close wildlife encounters, tracking white rhino on foot with an armed guide is a highlight not to be missed. Ongava Game reserve also has a good population of lion, eland, mountain zebra, black faced impala and a number of other antelope species. Mornings are normally spent within Etosha National Park, returning to Ongava in time for a lunch. After tea, guests head out onto the private reserve to enjoy more flora and fauna. 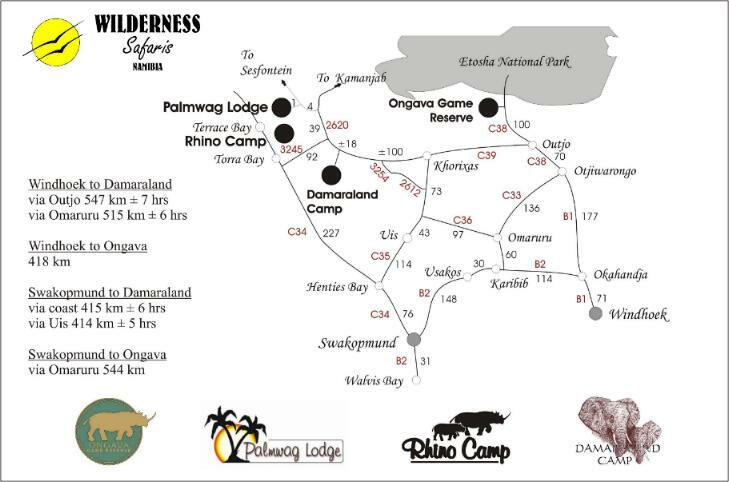 The option of tracking white rhino on foot is available as is night drives. Additional activities could also include full day excursions into Etosha National Park, taking along a picnic, subject to availability of vehicles and also a visit to one of the hides on the property. Private vehicles can be booked at an additional charge subject to availability either prior to departure or directly with the camp manager. In the early 1990s a group of Namibian, English, American and South African partners clubbed together and bought 30,000 hectares of land on Etosha's southern boundary. The aim of this venture was to create Namibia's finest private game reserve and to create a buffer for Etosha along its southern boundary. Ongava (meaning rhinoceros in Herero) was born, and a massive rehabilitation and restocking program took place. White rhino were introduced and over time black rhino migrated onto the reserve. Many thousands of animals are now found on Ongava including elephant, giraffe, gemsbok, springbok, red hartebeest, eland, wildebeest, zebra and the rare black faced impala. Lion, leopard and cheetah have also moved back into Ongava Reserve. Ongava tented camp is a small classic traditional tented camp. Guests sleep in "Meru" tents which are the classic East African style of tent. Each have double doors to allow for uninterrupted views of the bush and waterhole in front of camp and every tent has it's own covered verandah. The tents have been tastefully furnished each with it's own en suite thatched bathroom with flush toilet and unique open air private shower. The bar and dining area is built out of rock and thatch and has an intimate feel. Drinks and dinner can be enjoyed around the open air fire place and swimming pool, both of which overlook a productive floodlit waterhole situated at eye level in front of the camp. Activities. Mornings are normally spent within Etosha and afternoons on the reserve, tracking white rhino on foot being one of the many highlights. Additional activities could also include full day excursions into Etosha National Park, taking along a picnic, subject to availability of vehicles. Night drives on Ongava Reserve and visits to one of the hides on the property. Private vehicles can be booked at an additional charge subject to availability either prior to departure or directly with the Camp Manager. Just outside of the western entrance to the Etosha National Park. Minimum age limit is 8 years. 8 - 12 years old sharing with parents or in family unit: above discounted rates.